Or you can buy a ready-made pie shell, usually found in the freezer section of the grocery store. When making an un-cooked pie (like an ice cream pie), these pie shells will have to get baked and cooled before filling them. For those of you ready to tackle the pie dough making challenge, our friend Heidi at the Ward Street Bistro has a wonderful pie crust recipe that does not require “rolling out” the dough. This “Press in the Pan” pie dough recipe looks great for anyone intimated by a rolling pin! You can concoct a very simple pie without a recipe. 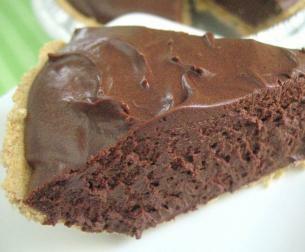 Buy a ready-made pie crust (or make a graham cracker one) and a tub of ice cream or frozen yogurt. Set the ice cream out to soften. Once you can scoop it easily, fill the pie crust, smooth the top and add any toppings you want (nuts, whipped cream, chocolate sauce). Then put it back into the freezer until serving time. Similarly, you can make a custom pie with pudding and fruit. Just buy a box of pudding mix – chocolate, vanilla, or another flavor – follow the directions, and pour it into a ready-made pie crust. Top it with sliced bananas, strawberries, or whatever you like. Refrigerate the pie until you are ready to serve it. The folks over at Baked Perfection tried this recipe (from the Food Network show Down Home With the Neely’s) for a Fourth of July party and fell in love with it. Set in a graham cracker crust, its sweet, lemony filling calls for frozen lemonade concentrate, whipped cream and sweetened condensed milk. An easy alternative to a baked lemon meringue pie! 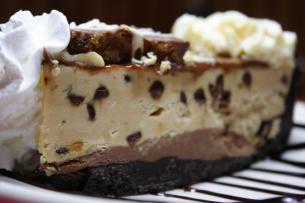 Hello, peanut butter fans? It’s your dream pie calling. This one has a crust made of crushed Nutter Butter cookies (but feel free to substitute a pre-made one) and a frosty peanut butter and cream cheese filling. This pie is not frozen in the sense that it sits in the freezer; it’s a baked blueberry pie that calls for frozen blueberries and a frozen pie crust. I’m including it because summer is the time for blueberries (even frozen) and this is a very easy version of your typical fruit pie that calls for crust made from scratch. One bite of this decadent pie and you’ll never look at silken tofu the same way again. It’s one of the keys to this pie’s creamy fudginess. Here’s another recipe that involves tofu. This pie uses either a homemade or store-bought graham cracker crust to hold an intense filling. It takes about 15 minutes to make, then goes in the fridge or freezer for a couple of hours. Anything mango is great in the summer. This one contains mango puree which you can buy in a can or make your own. A can of frozen limeade concentrate is what gives this simple pie its lime flavor. Easy Coconut Banana Cream Pie takes just 20 minutes to make! This pie will need 4 hours in the refrigerator to set. It’s worth the wait! Some of the best pie crust I’ve ever eaten was in Japan. For a work project (long story), my two (male) colleagues and I baked 36 pumpkin pies from scratch over 5 days (after work, in 4 gas ovens, in a community center). The men volunteered to do the pie crust: they were as meticulous with the measurements and the instructions not to overwork the dough as if they were working with high explosives. And the crust was remarkable! I suppose the moral to the story there is that if I actually paid attention to the recipes I’m allegedly following, my food would turn out better, too! I find that most of the pre-made pie crusts in the stores have ingredients that I don’t want or are too high in sugar. I keep meaning to experiment with phylo pastry…I’m sure there’s got to be a good way to rig it up into easy, sugar-free pastry crust, too. I think your suggestions for freezer and refrigerator pies are thoughtful and timely. Who wants to turn on the oven in summer weather? But it is still nice to be able to offer guests a refreshing dessert. How I would love to have tried those Pumpkin Pies! My Pumpkin Pie recipe would be so much better done in a home made pie crust, BUT I must say that making pie crust from scratch is one of the most intimidating cooking task a beginner could do. It does take skill and cooking know-how to get it right. It is all about the “feel” of the dough. An experienced baker will even know how to make adjustments for baking on a humid day. 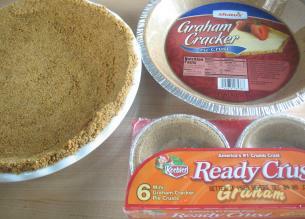 Making your own Graham Cracker Crust is a good beginning, and the success rate is very high. You can substitute the sugar with honey or maple syrup. Working with phyllo dough can also be a bit tricky. Here is a video on How to Work With Phyllo (fillo?) dough that is a good primer. Kathy, I know what you mean: my mother instilled a life-long terror of making pie crust in me. But you /wouldn’t/ have liked to try my pumpkin pies,I promise you. We couldn’t buy pre-cooked cans of pumpkin in Japan,so we had to cook down kabocha, the native Japanese pumpkins, to make the filling completely from scratch. Kabocha has an edible peel, which we left on…but the combination of the orange flesh with the dark green peel turned our filling completely brown. All of the Japanese people at the event called it “gravy pie” and they were afraid to try it! I wound up giving whole pies away as door prizes (to other foreigners) at the end of the night because we were still up to our ears in pies! 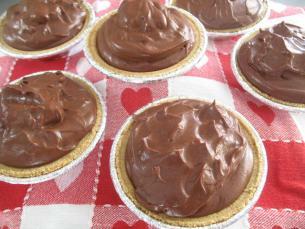 for all you pie lovers, please visit the American Pie Council website at http://www.piecouncil.org and join up! the 2009 National Pie Championships will be held next April in Orlando, Florida. Watch us on Food Network next month! Thanks Nancy! It sounds like it is going to be a lot of fun! Hi, thanks for the info. I really think it is very good. Kabocha has an edible peel which we left on…but the combination of the orange flesh with the dark green peel turned our filling completely brown. These cracker crusts can also be made with many other sweet cracker/cookies like oreo cookies, ginger snaps, and vanilla wafers.